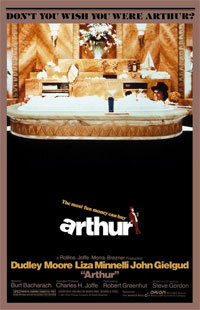 Arthur (Dudley Moore) is a happy drunk with no pretensions at any ambition. He is also the heir to a vast fortune which he is told will only be his if he marries Susan. He does not love Susan, but she will make something of him the family expects. Arthur proposes but then meets a girl with no money who he could easily fall in love with. 5th Avenue and West 58th Street, Manhattan.